McDonald’s Corp, the largest restaurant chain in the world posted sales growth for same stores that came up short of analyst expectations, which stoked concerned that the fast food industry in the U.S. was heading toward a recession. Sales at same-stores were up 3.1% globally, said the company based in Oak Brook, Illinois. Analysts however were expecting an increase of 3.6%. Analysts have raised some concern that restaurants could be hitting a downturn, which is a harbinger for a broad slump in the economy in the U.S. for 2017. Rivals in fast food like Wendy’s are piling on their discounts and their promotions putting heavy pressure on McDonald’s to maintain low prices. That has in turn undercut the benefit it has from adding breakfast to its all day menu in the U.S. during 2015. The industry overall became weaker and McDonald’s clearly felt some of what took place, said one analyst in the restaurant industry. Shares of McDonald’s were down by up to 3.8% in New York, which represented the biggest drop intraday since February 5. McDonald’s was up 7.8% through its close of business on Monday, outpacing the increase of 6.1% of the S&P 500 Index. The other cut ratings for 11 stocks in restaurants saying it turned bearish on the industry in the U.S.
Texas Roadhouse Grill was down 6.5%, which represented its worst double in close to a year, while the Noodles & Co plunged 20%. 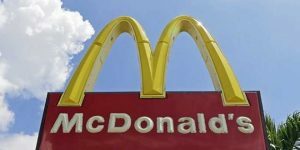 For McDonald’s, this slowdown hampers efforts taken by CEO Steve Easterbrook to turn the company around. McDonald’s sales gains in same stores has slowed to just 1.8% domestically during the most recently end of the quarter, in comparison with 5.4% the previous quarter. Analysts estimated an increase of 3.2%. Earnings dropped by 1 cent ending the quarter at $1.25 per share for the period. However, when eliminating a one-off expense of 20 cents, the figure was able to top analyst expectations of $1.39. McDonald’s also has faced more costs as part of its turnaround plan. The fast food giant is selling restaurants that are company owned and moving its corporate headquarter from Chicago’s suburbs to downtown. Revenue was down 3.6% ending the quarter at $6.27 billion matching estimates of analysts. Its move to sell company owned locations to its franchisees lowered its volume of total sales.